It’s time to celebrate this week with others on Ruth Ayers’ weekly link up. Find other celebration posts here. Today I celebrate this week at TCRWP’s Summer Writing Institute. In addition to keynotes from Carl Anderson, Lucy Calkins, Mary Erhenworth, Naomi Shihab Nye and Sarah Weeks, I attended daily break out sessions on Writing about Reading with Ali Marron and Using Children’s Literature as Mentor Text with Shana Frazin. The learning was monumental. Ideas intermingled and cross-pollinated. This was not simply a Writing Institute; it was a Literacy Institute. First: It is a beautiful thing to help students find their voice when writing about reading. Too often this work translates into an accountability tool, destroying the good intentions of teachers and potential book love. By offering students some latitude and ownership in their writing about reading process, we send the message of agency and trust. Second: As with any learning, models matter. Offering freedom to develop a personal style, we all benefit from seeing many models teacher’s and students’. 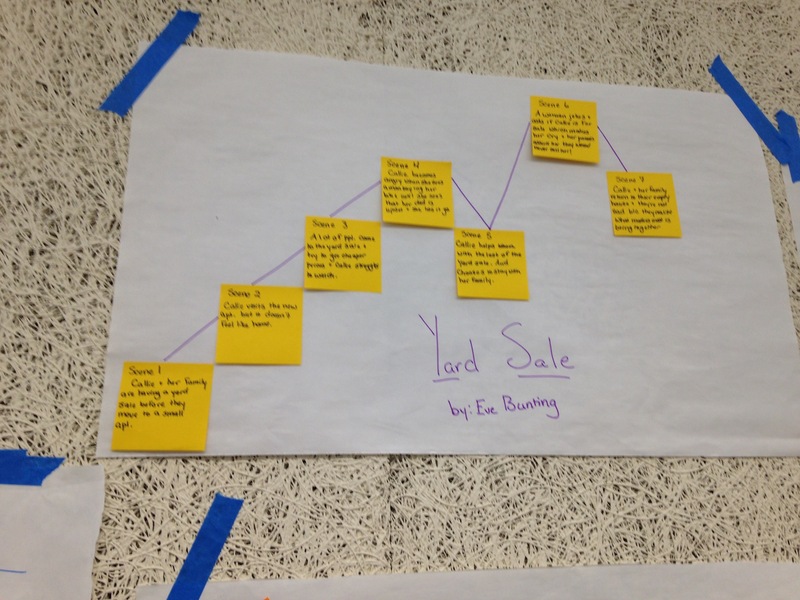 Imagine your first week of school creating a gallery of possible ways to write about reading. Third: Audience matters. When we have an audience, our engagement goes sky hight. Everyone wants to come to the party with something valuable to share. The work is purposeful just because someone else is depending on you. Fourth: Tools, strategies and scaffolds are necessary but, scaffolds should be training wheels. When we introduce a scaffold, the plan to take it away should be an integral part of the plan. Fifth: Examining children’s literature as a mentor text build reading and writing muscles! We looked at several texts from a structural point of view. This work is thought-provoking as a reader and a writer. 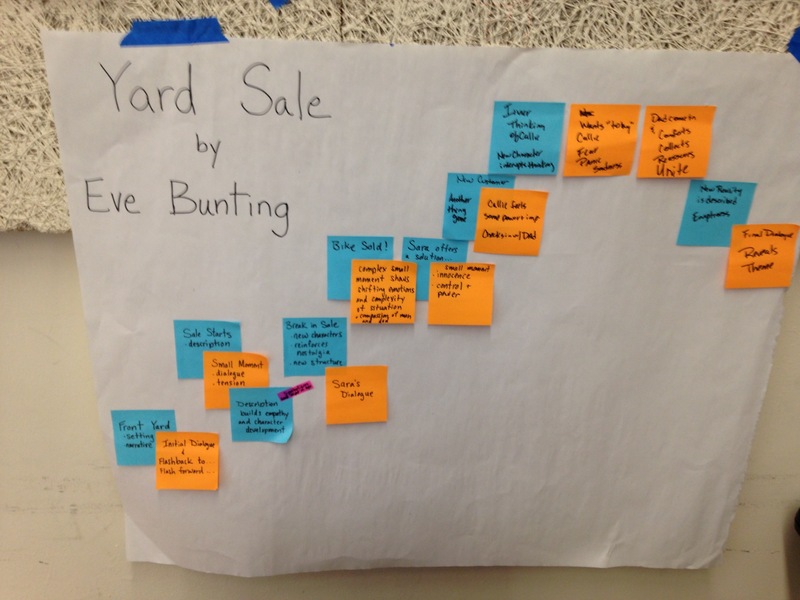 Look at the many possible ways teachers mapped out the structure of Eve Bunting’s Yard Sale. After that work, we added a layer of thought: How the theme was revealed through the lens of structure. The first example might be an upper elementary analysis followed by a middle school interpretation. This brilliant work speaks to working collaboratively and thinking deeply about a text. Imagine how this could be used as a way to inspire narrative writing structures or as a way to analyze Bunting’s use of theme in a literary essay. To paraphrase Shana, I was so happy these beautiful teachers came to school this week. 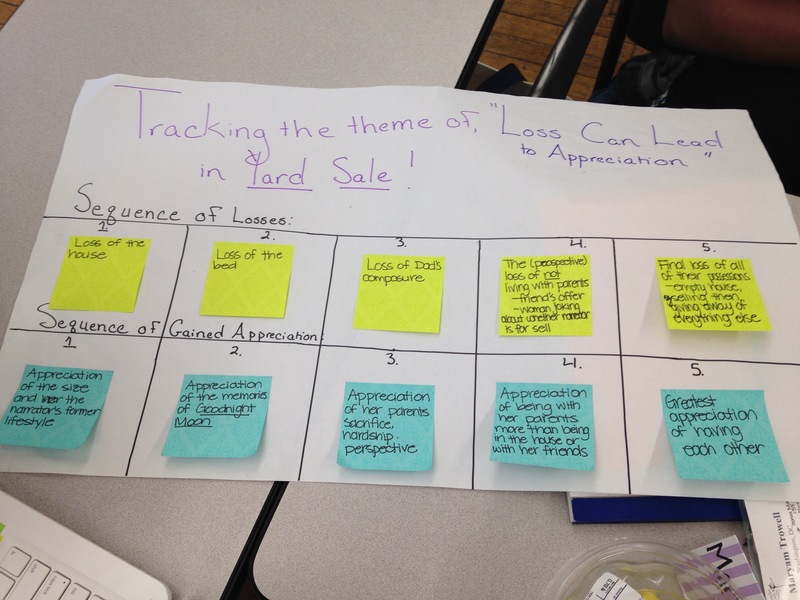 Thank you so much for posting about TCRWP. I struggle with getting my kids to write about reading. I love the idea of building that muscle using mentor texts. I hope you continue to post about your experiences there for those of us that aren’t lucky enough to attend. Oh, I AM jealous…but not that jealous, because I have wonderful teacher friends who blog about their learning. I feel like I got a small taste of your week thanks to you and Fran and Tara who blogged about all of the amazing learning going on at TC. I’m grateful for your thoughtful & reflective posts that are always filled to the BRIM with insightful information!! Thank you! You know I am jealous. How I would have loved learning and talking and thinking with you this week. Your posts and tweets have helped fill the gap. Thanks for sharing. I like hearing all of this, Julieanne, but really love the idea of giving choice in the ideas for reading response when starting the year. What a great time you must have had, & now fun to plan for next year from all these ideas. Happy you got to go! Thank you for sharing all of your learning here. So interesting! Thank you for sharing about it. So glad you shared your thinking from TCRWP. Can’t wait to come back and spend more time looking at the structure from Yard Sale. I am so intrigued by this post! Is there a chance you could share some different ways students could write about reading? As a former fourth grade teacher I liked starting the year with an author study of Eve Bunting’s books or Patricia Polacco’s books so that we could use them as mentor texts to begin a narrative writing unit and build structures and routines of our writing workshop. However, the amazing Shana Frazin takes it to a whole new incredible level! Putting jealousy aside. I appreciate that you shared your notes with us. Isn’t it interesting that barely out of school we already start looking forward, thinking of how to improve the learning experiences, for us and for the students? Thank you, thank you, thank you! A literacy institute indeed. Safe trip home, my friend. I am jealous….very, very jealous! Thank you so much for sharing your learning with us!! 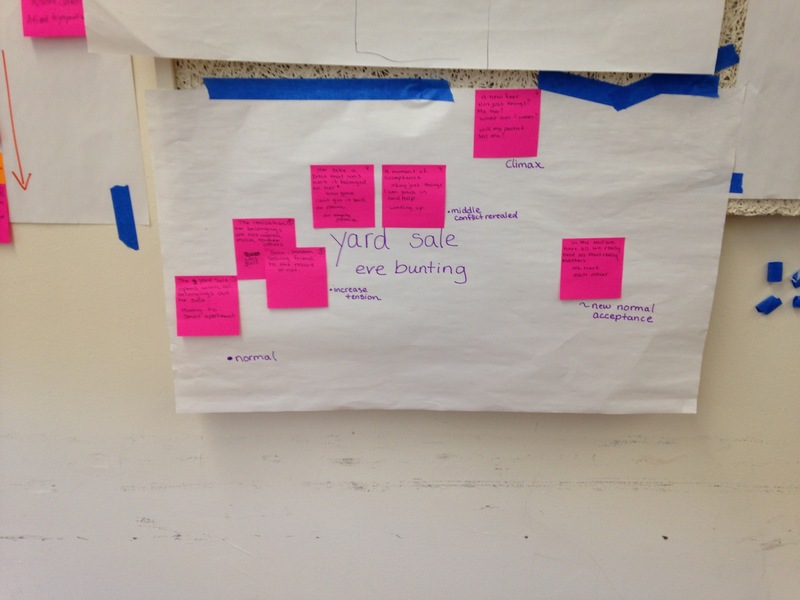 Julieanne – Than you for summarizing all the big thinking in your section with Shana. 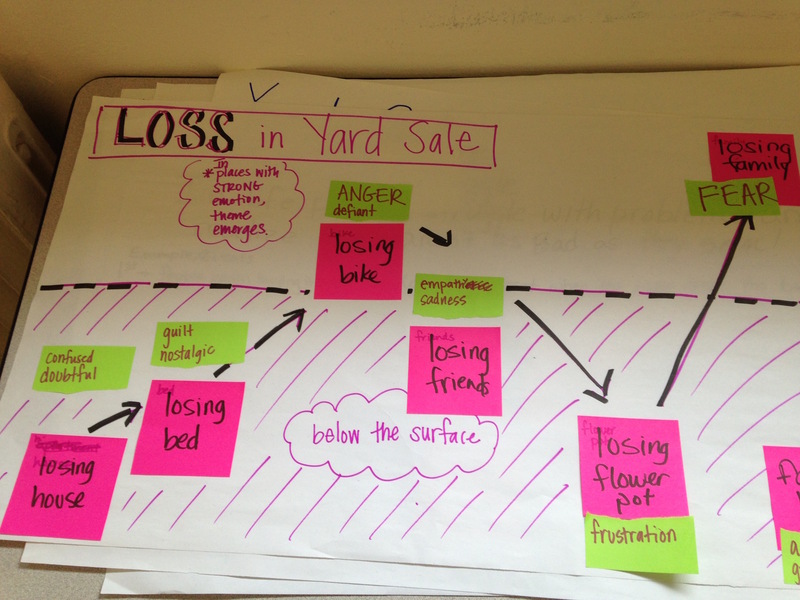 I spent a week with Sarah Weeks where we did similar work by identifying the emotional arc of a story, which was so helpful. It’s genius to explore all narrative elements in deconstructing story in order to construct. Is Shana proposing that our students work in inquiry groups to create these models as part of the launch? Did you work on one together whole class, or did Shana share one as an example and then send you off? Our district has decided to launch our 3-5 narrative units with character driven narratives rather than personal narratives, so this work will be so helpful. Thanks again for sharing such outstanding information! Shana demoed a narrative arc with a Pinky and Rex text. Then we, as teachers, went off with our chosen texts to work through how we saw the structure. The intent was to look through the lens of structure. I think it would be worthwhile to explore mentor texts in this fashion with students, not just for writing but to think about structure in our reading work as well. I believe that inquiry is always a good place to start! I want to know more about using picture books for middle schoolers writing workshop.